· A Quick Recap of the March 2019 Universities Studying Slavery (USS) Meeting in Williamsburg. A Quick Recap of the March 2019 Universities Studying Slavery (USS) Meeting in Williamsburg. In March, Universities Studying Slavery (USS) members participated in the Lemon Project’s 9th Annual Spring Symposium, “Celebrating Legacies, Constructing Futures: Four Hundred Years of Black Community and Culture.” What a wonderful weekend! It all started with a USS business meeting where representatives from different member institutions gave updates on their various institutional efforts and had in-depth discussions on a host of important topics including the need to establish an institutional backing for USS, ongoing memorialization efforts, and securing administrative backing at individual member institutions. Tougaloo College Research and Development Foundation President John Rosenthall updated everyone on Building HBCUs Contracts and Research Capacity Through Partnerships (be on the lookout for the website to go live on April 29th! )—the first of several proposed multi-institution repair programs. It was also a beautiful day for the amazing behind the scenes tour at Historic Jamestown to see the Angela Site and the archaeological collections. That was followed by a day full of remarkable panels, many focused on practical repair and efforts to shift to trauma repair by member institutions Many panels also highlighted the importance of preserving African American history. The day culminated with an amazing presentation by Christy Coleman, CEO of the American Civil War Museum in Richmond, about the new museum that’s slated to open to the public in May 2019. Panel sessions continued on Saturday—energy and interest did not dissipate. We want to thank The Lemon Project—in particular Project Director Dr. Jody L. Allen and her amazing team, for such a fine meeting and conference. We are once again reminded of how important it is for schools doing this work to remain in conversation with one another. We have so much to learn! Each day started with a round table session engaging attendees. Saturday’s round table, “New Perspectives on Restorative Justice and Collective Healing,” led by Rev. Dr. Joanne M. Braxton, was particularly powerful for the last day in Williamsburg. Saturday’s panels largely focused on panels that described dismantling legacies of slavery and Jim Crow in museums, commemoration, oral history, and archives. The weekend was full of wonderful, meaningful conversations for everyone involved. I think we all left Williamsburg with renewed vigor and commitment to the mission of Universities Studying Slavery (USS) at each of our institutions—truth-telling, meaningful community engagement, and implementing reparative justice initiatives. 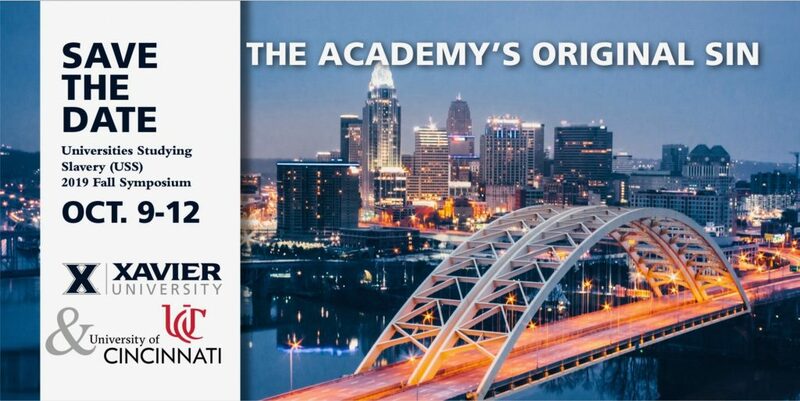 We look forward to seeing everyone in Cincinnati in October when the University of Cincinnati and Xavier University co-host the fall meeting and conference. —Ashley Schmidt, University of Virginia President’s Commission on the University in the Age of Segregation (PCUAS) Program Officer.